The Routledge Handbook of Translation and Philosophy presents the first comprehensive, state of the art overview of the complex relationship between the field of translation studies and the study of philosophy. The book is divided into four sections covering discussions of canonical philosophers, central themes in translation studies from a philosophical perspective, case studies of how philosophy has been translated and illustrations of new developments. With twenty-nine chapters written by international specialists in translation studies and philosophy, it represents a major survey of two fields that have only recently begun to enter into dialogue. 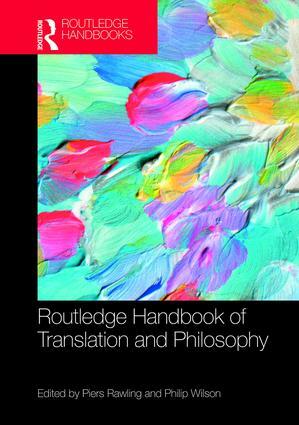 The Routledge Handbook of Translation and Philosophy is a pioneering resource for students and scholars in translation studies and philosophy alike. Featuring a wealth of original contributions by renowned philosophers, translation theorists, and translators, this is the first major work to bring together the disciplines of philosophy and translation studies. Accessibly written throughout, the Handbook demonstrates the mutual enrichment that inheres in the dialogue between these two disciplines, opening up important new avenues for research and offering a fresh perspective on key themes in translation studies. the philosophy of history and translation. Routledge Handbooks in Translation and Interpreting Studies provide comprehensive overviews of the key topics in translation and interpreting studies. All entries for the handbooks are specially commissioned and written by leading scholars in the field. Clear, accessible and carefully edited, Routledge Handbooks in Translation and Interpreting Studies are the ideal resource for both advanced undergraduates and postgraduate students.